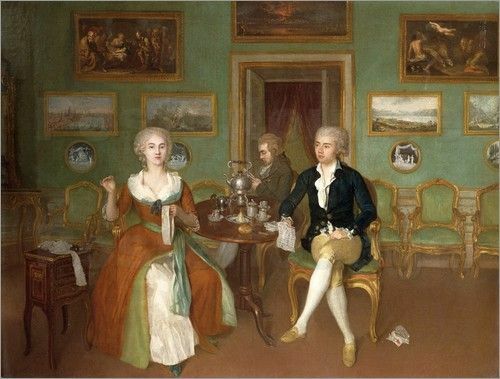 In the 18th century tea drinking was an established social custom with a recognized etiquette and distinctive equipage as we know from the pictures and writings of the period. At teatime men and women gathered to pursue leisurely conversations and enjoy the sociability of the home. 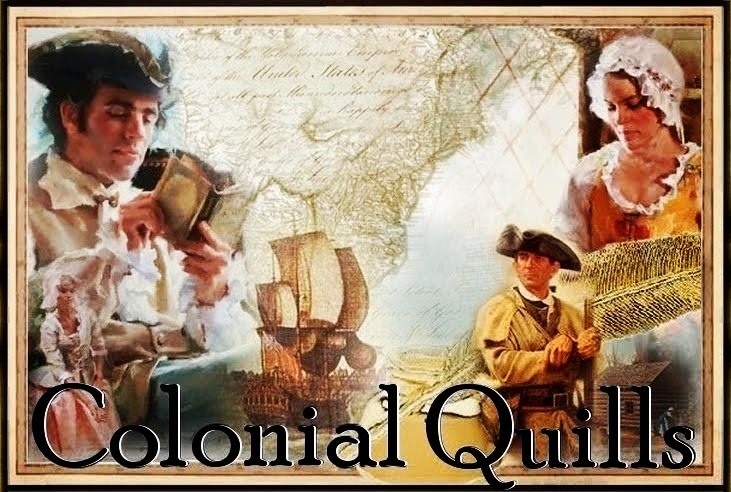 Today I will continue the discourse of Taking Tea in Colonial America from yesterday's post (Part 1) and share on the topic of Tea Equipage. This information is highlighted from a public domain book entitled Tea Drinking in 18th-Century America: Its Etiquette and Equipage by Rodris Roth that can be found in its entirety at Project Gutenburg. Excerpts are in italics. Throughout the 18th century the well-equipped tea table would have displayed most of the items seen in this painting: a teapot, slop bowl, container for milk or cream, tea canister, sugar container, tongs, teaspoons, and cups and saucers. These pieces were basic to the tea ceremony and, with the addition of a tea urn which came into use during the latter part of the 18th century, have remained the established tea equipage up to the present day. Tea furnishings, when in use, were to be seen upon rectangular tables with four legs, square-top and circle-top tripods, and Pembroke tables. 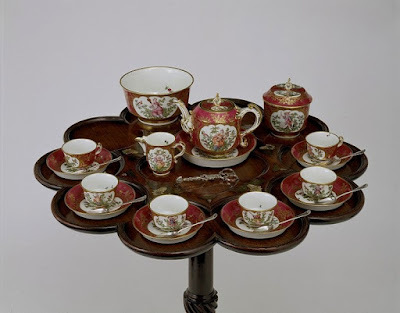 Such tables were, of course, used for other purposes, but a sampling of 18th-century Boston inventories reveals that in some households all or part of the tea paraphernalia was prominently displayed on the tea table rather than being stored in cupboards or closets. The most popular type of tea table apparently was the circular tripod; that is, a circular top supported on a pillar with three feet. This kind of table is seen again and again in the prints and paintings and is listed in the inventories of the period. These tables, usually of walnut or mahogany, had stationary or tilt tops with plain, scalloped, or carved edges. In addition, trays or teaboards of various sizes and shapes were sometimes used. They were usually circular or rectangular in form, occasionally of shaped or scalloped outline. 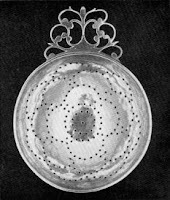 Some trays were supported upon low feet; others had pierced or fretwork galleries or edges to prevent the utensils from slipping off. Wood or metal was the usual material, although ceramic trays were also used. At large gatherings a tray was often employed for passing refreshments. . . Whether placed on a bare or covered table, it arrived with the various pieces such as cups and saucers, spoons, containers for sugar and cream or milk, tongs, bowls, and dishes arranged about the teapot. Table cloths—usually square white ones that showed folds from having been stored in a linen press—were used when tea was served, but it is difficult to say with any certainty if their use depended upon the whim of the hostess, the type of table, or the time of day. A cloth probably was used more often on a table with a plain top than on one with scalloped or carved edges. However. . . it was perfectly acceptable to serve tea on a plain-top table without a cloth. 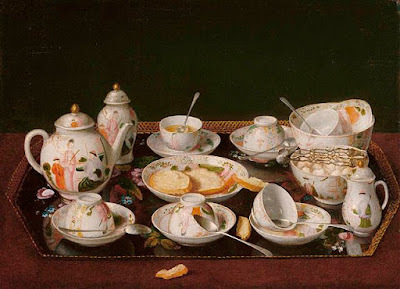 Throughout the 18th century the well-equipped tea table would have displayed most of the items seen in this painting (below): a teapot, slop bowl, container for milk or cream, tea canister, sugar container, tongs, teaspoons, and cups and saucers. 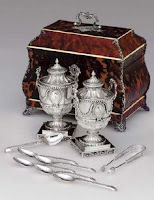 These pieces were basic to the tea ceremony and, with the addition of a tea urn which came into use during the latter part of the 18th century, have remained the established tea equipage up to the present day. Such tea furnishings of ceramic were sold in sets; that is, all pieces being of the same pattern. 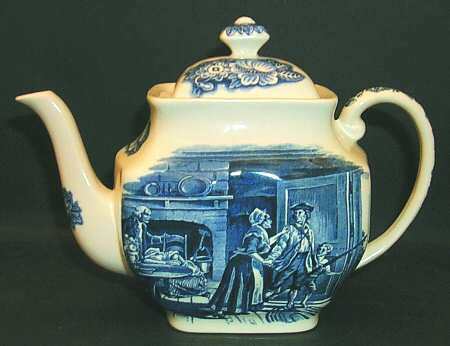 Newspaper advertisements in the 1730’s specifically mention “Tea Setts,” and later in the century ceramic imports continue to include “beautiful compleat Tea-Setts”. In the early 18th century, tea sets of silver were uncommon if not actually unique. . . The pieces of tea equipage could be purchased individually. 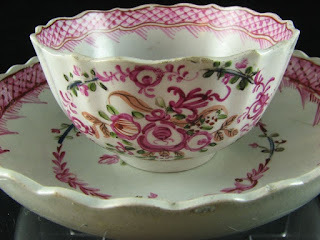 For instance, teacups and saucers, which are differentiated in advertisements from both coffee and chocolate cups, regularly appear in lists of ceramic wares offered for sale, such as “very handsome Setts of blue and white China Tea-Cups and Saucers,” or “enamell’d, pencill’d and gilt, red and white, blue and white, enamell’d and scallop’d, teacups and saucers.” These adjectives used by 18th-century salesmen usually referred to the types and the colors of the decorations that were painted on the pieces. Porcelain, however, had long been a part of China-trade cargos to Europe and from there to America. 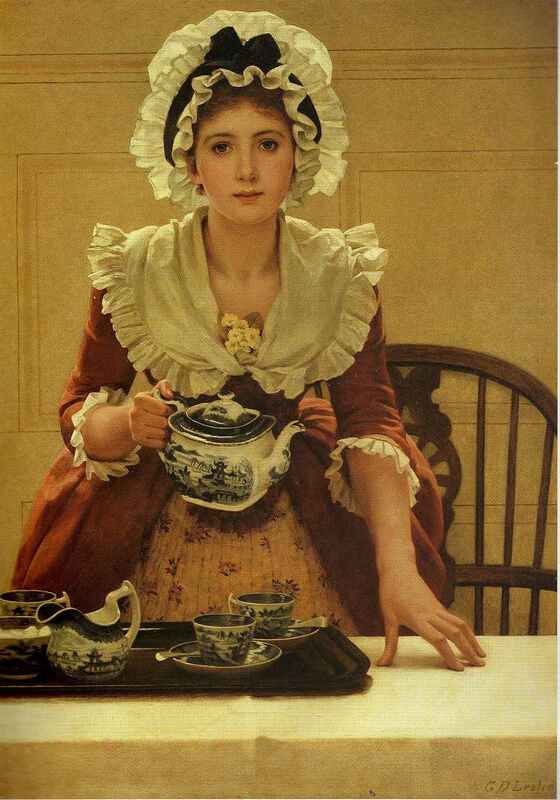 The early shipments of tea had included such appropriate vessels for the storage, brewing, and drinking of the herb as tea jars, teapots, and teacups. The latter were small porcelain bowls without handles, a form which the Europeans and Americans adopted and continued to use throughout the 18th century for tea, in contrast to the deeper and somewhat narrower cups, usually with handles, in which chocolate and coffee were served. Whatever the ware, the teacups and saucers, whether on a tray, the cloth, or a bare table, were usually arranged in an orderly manner about the teapot, generally in rows on a rectangular table or tray and in a circle on a round table or tray. . . Generally, cups and saucers were not piled one upon the other but spread out on the table or tray where they were filled with tea and then passed to each guest. Teaspoons, when in use, might be placed on the saucer or left in the cups. . .Teaspoons also were placed in a pile on the table or in a silver “Boat for Tea Spoons,” or more often in such ceramic containers as “Delph Ware ... Spoon Trays,” or blue-and-white or penciled china “spoon boats.” Shallow dishes . . . and hemispherical bowls were used as containers for sugar. Often called “sugar dishes” or just “sugars,” they were available in delftware, glass and silver as well as in blue-and-white, burnt, enameled, and penciled china. … Tongs were especially suited for lifting the lumps of sugar from their container to the teacup. Containers for cream or milk may be seen in many of the 18th-century teatime pictures and are found in the advertisements of the period under a variety of names…There were cream pails, urns, and ewers of silver plate, and plated cream basins “gilt inside.” Milk pots, used on some tea tables instead of cream containers. . .
Often a medium-sized bowl, usually hemispherical in shape, is to be seen on the tea table, and it is most likely a slop bowl or basin. According to advertisements these bowls and basins were available in silver, pewter, and ceramic. Before a teacup was replenished, the remaining tea and dregs were emptied into the slop bowl. Then the cup might be rinsed with hot water and the rinsing water discarded in the bowl. The slop basin may also have been the receptacle for the mote or foreign particles—then inherent in tea but now extracted by mechanical means—that had to be skimmed off the beverage in the cup. . . No doubt, tea strainers were also used to insure clear tea. The tea dregs might then be discarded in the slop bowl or left in the strainer and the strainer rested on the bowl. The teapot was, of course, the very center of the social custom of drinking tea; so, it usually was found in the center of the tray or table. At first, only teapots of Oriental origin imported with the cargos of tea were available, for the teapot had been unknown to Europeans before the introduction of the beverage. However, as tea gained acceptance as a social drink and the demand for equipage increased, local craftsmen were stimulated to produce wares that could compete with the Chinese imports. Teapots based on Chinese models and often decorated with Chinese motifs were fashioned in ceramic and silver. No doubt many an 18th-century hostess desired a silver teapot to grace her table and add an elegant air to the tea ceremony. Tea kettle with lamp stand. 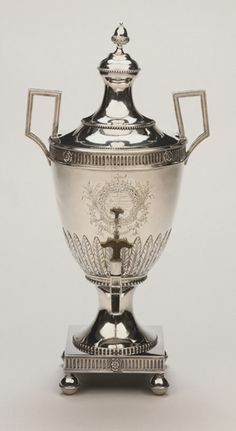 By the end of the century “an elegant silver tea-pot with an ornamental lid, resembling a Pine-apple” would have been the wish of a fashion-conscious hostess. Less expensive than silver, but just as stylish according to the merchants’ advertisements were “newest fashion teapots” of pewter or, in the late 18th century, Britannia metal teapots. The latest mode in ceramic ware also was to be found upon the tea table. Sometimes the teapot, whether ceramic, pewter, or silver, was placed upon a dish or small, tile-like stand with feet. These teapot stands served as insulation by protecting the surface of the table or tray from the damaging heat of the teapot. Stands often were included in tea sets but also were sold individually. . .The stands must have been especially useful when silver equipage was set on a bare table top; many of the silver teapots of elliptical shape with a flat base, so popular in the latter part of the 18th century, had matching stands raised on short legs to protect the table from the expanse of hot metal. On occasion the teapot was placed on a spirit lamp or burner to keep the beverage warm. In most instances it was the hot water kettle that sat upon a spirit lamp or burner rather than a teapot. Kettles were usually related to the form of contemporary teapots, but differed in having a swing handle on top and a large, rather flat base that could be placed over the flame. Advertisements mention teakettles of copper, pewter, brass, and silver, some “with lamps and stands.” The actual making of tea was part of the ceremony and was usually done by the hostess at the tea table. 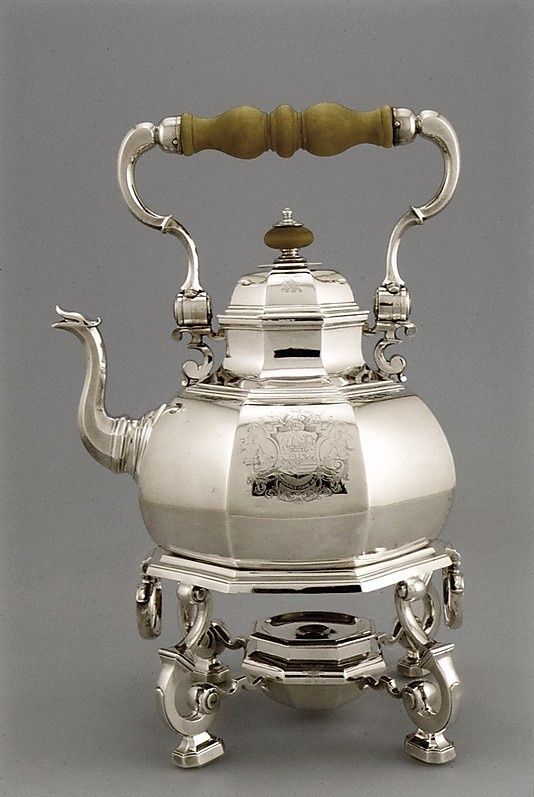 This necessitated a ready supply of boiling water close at hand to properly infuse the tea and, as Ferdinand Bayard reported, it also “weakens the tea or serves to clean up the cups.” Thus, the kettle and burner on their own individual table or stand were placed within easy reach of the tea table. According to 18th-century pictures the kettle was an important part of the tea setting, but it seldom appeared on the tea table. . . The square stands often had a slide on which to place the teapot when the hot water was poured into it. The tea canister, a storage container for the dry tea leaves, was yet another piece of equipment to be found on the table or tray. Ceramic canisters of blue and white, and red and gold, could be purchased to match other tea furnishings of the same ware, and silver tea canisters often were fashioned to harmonize with the silver teapots of the period. Individual canisters were produced, as well as canisters in sets of two or three. A set of canisters usually was kept in the box in which it came, a case known as a tea chest or tea caddy, such as the “elegant assortment of Tea-caddies, with one, two and three canisters” advertised in 1796. Canister tops if dome-shaped were used to measure out the tea and transfer it to the teapot. Otherwise, small, short-handled spoons with broad, shallow bowls known as caddy spoons and caddy ladles were used. 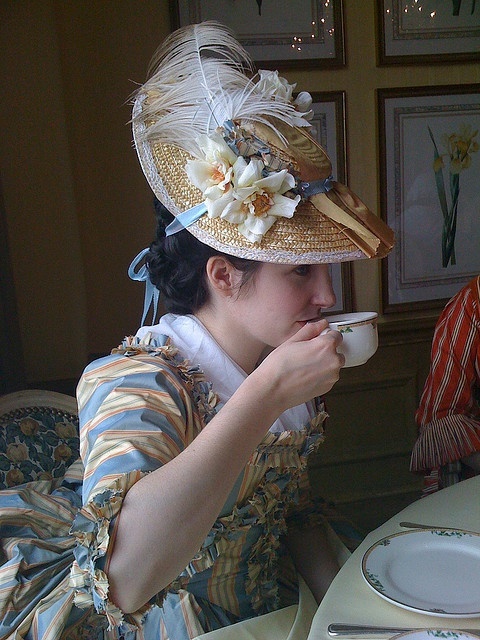 However handled, the tea could have been any one of the numerous kinds available in the 18th century. Do you have a tea service or any special tea equipage? What is your favorite flavor of tea? Do you brew it from loose leaf leaves or do you use tea bags? 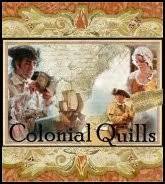 Please be sure to visit us for our next Colonial Quills New Book Release Tea Party Friday, October 16, 2015. You may join us in the salon (our Facebook event page) and then in our tea parlor here at Colonial Quills. I really enjoyed learning about the "proper tea", thanks for sharing Carla. I don't have a tea service but I do have several tea pots and tea cups/saucers. Mostly I use tea bags. I love herbal teas (decaf only for me), my favorite is the Pomegranate-Raspberry Herbal tea and Lady Gray from Twinings Tea. Years ago my son/daughter-in-law gave me loose tea, Cranberry-Orange Herbal Tea, that is delicious. I drank it sparingly so it would last longer. I have not been able to find more of it. Love this article. Fabulously written. I do adore tea, though I have not participated in a true 'tea service' since my daughter was young. I wanted her to experience the absolute fun of it as I had in the UK. Cucumber and dill finger sandwiches, tiny shortbreads and the ceremony of hot water potting and pouring up a good cup of tea. To this day she says it is one of her best memories. Your article has reignited my love of the serving up!